The Environment Agency has published an independent report commissioned to investigate how water got into the Foss Barrier Pumping Station in York on 26 December 2015. On Boxing Day, more than 600 homes and businesses were affected when exceptionally high rainfall and river levels led to extensive flooding in the city of York. 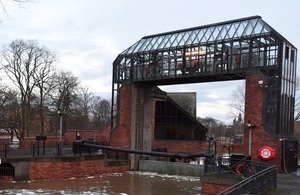 The Environment Agency today (Thursday 12 May) published an independent report commissioned to investigate how water got into the Foss Barrier Pumping Station in York that day, forcing staff to shut down the pumps and open the barrier. The peak flow in the Foss on 26 December was extreme, equating to an event with a 0.5% (1/200) probability of occurring each year. All eight pumps at the Foss Barrier were working that day at full capacity but the water levels in the Foss continued to rise, by approximately 140mm an hour. The Environment Agency’s decision to raise the barrier on the evening of 26 December prevented even more widespread flooding; and delayed the peak water levels on the River Foss by some 18 hours. Environment Agency staff opened the barrier after water entered the building, forcing them to turn off the electricity supply and the pumps. The report found that a build up of water in the barrier’s underground service tunnel, combined with water flowing through the drainage system, filled the service tunnel until water emerged from the floor access points inside the pumping station building. The report concludes that most of the water that entered the building did so via the service tunnel drainage system through a combination of a leaking construction joint and an access cover which had been opened to pump water out of the service tunnel. The report makes a number of recommendations to minimise the risk of water entering the facility in future. The Foss Barrier has been fully operational since the end of December. A £17 million upgrade is now underway which will address all the recommendations made in the report. This includes addressing water leaks in the service tunnel and new pumps with an increased capacity which will be installed by winter 2016. By the end of 2017 the pumping station will have been raised to ensure the barrier is more resilient in the long term. I was in York in the immediate aftermath of the Boxing Day floods. I know that every house and business flooded is a personal tragedy. We can never prevent all flooding, but we can and will do everything we can to help reduce the risk to householders and businesses. I welcome this report, which will help us make the Foss Barrier even more resilient in future to extreme floods and greater flows on the River Foss. The upgrade work, which began in April, will see the pump capacity increase, providing a higher standard of protection for local people. Work on the Foss Barrier is just one component of a wider programme of work, following the Government’s announcement of £45 million for York. We are taking a catchment wide approach to improve flood resilience in the city, looking at how we can slow the flow in the upper reaches of the Ouse and Foss catchments as well as new flood defences. Residents and other interested parties will have the opportunity to find out more about the package of work the Environment Agency is planning for York, the upgrade of the Foss Barrier and the independent report, at a public exhibition to be held on 20-21 May at the Hotel 53, Piccadilly, York. Levels on the River Foss on Boxing Day 2015 were higher than anything previously recorded over the past 30 years. Consultants, CH2M, were instructed to look into how water got into the structure and what steps would need to be taken to minimise the risk of it ever happening again. The report provides a summary of the facts relating to 26 December 2015 when water entered the building at the Foss Barrier, including a full sequence of events. It also makes recommendations for minimising the risk of water entering the building in the future.